Comparing Project Management Institute (PMI) and Information Technology Infrastructure Library (ITILⓇ) certifications can get a bit tricky, as there is no simple one-to-one comparison. 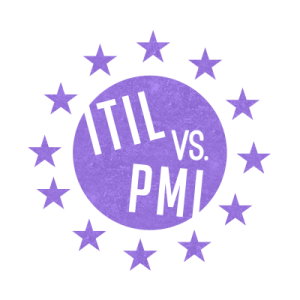 Often, learners will try to pit PMI and ITILⓇ certifications against one another, but increasingly, the two certification paths are being viewed as complementary to one another. The two frameworks represented can create great synergy that will benefit your workplace. Deciding what path is best for you will depend largely on your career aspirations. If you are committed to staying in the IT industry, and want to develop skills and knowledge to help you provide excellent IT services, ITILⓇ is likely a good fit! 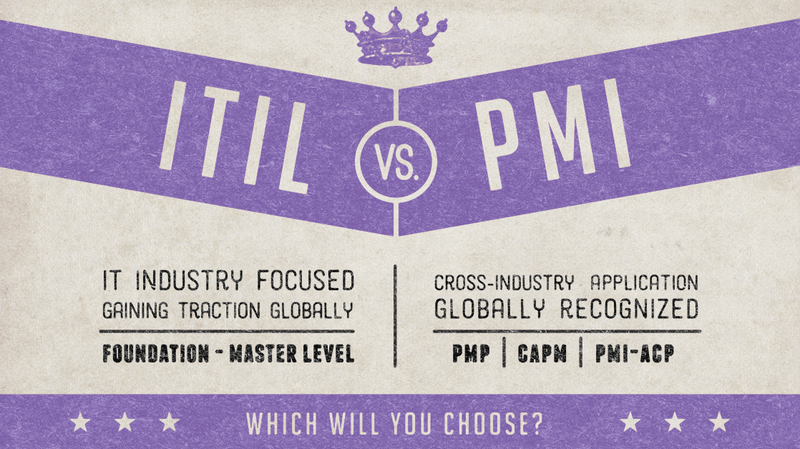 However, if you might consider leaving the IT sphere of services, or if you aspire to higher-level management that will reach beyond the realm of IT, PMI might be a good option. PMI is globally recognized and highly respected. For some IT professionals, a PMI project management certification may not be necessary until they have been in the field for some time. In fact, learners must have logged project work hours before being eligible for PMI project management certification exams. ITILⓇ is widely implemented and recognized in the UK and western Europe. It is gaining popularity and momentum in the US and across the globe. It serves as an excellent starting point for many young IT professionals who intend to stay in IT long-term. ITILⓇ certification exams require no previous experience or other prerequisites, so they are perfect for those just starting out on project work. With these considerations in mind, let’s explore some of the details of each path so you can make well-informed decisions. PMI project management certifications generally equip learners with skills and knowledge that can be best applied to large-scale efforts such as construction or manufacturing. PMI defines project management as any endeavor to produce a unique service, product, or result. PMI certified project management skills are easily transferrable to any industry. In addition, CBT Nuggets is a Registered Education Provider (REP) for PMI continuing education units (CEUs). As an REP, we offer a variety of courses to help you keep your certification up-to-date. ITILⓇ certifications are designed to specifically prepare learners with the best practices and language needed for IT-related service delivery. Arguably, IT-related projects could fall under the umbrella of large-scale projects (such as those addressed by PMI certifications), but more often, ITILⓇ certifications address the ongoing, day-to-day projects necessary to keep an organization running. Unlike PMI project management, ITILⓇ equips IT professionals with best practices for effective, efficient delivery of services. TechRepublic provided a great snapshot of 10 things you should know about ITILⓇ. Trainer Chris Ward recently released his ITILⓇ Foundations course. And he will be starting work on ITILⓇ Intermediate soon (check our Upcoming Training to see his progress). You can learn more from Chris by checking out his 5 Reasons to Learn ITILⓇ blog post or by watching a recording of his recent webinar, Unlocking ITIL’sⓇ Value. Rather than looking at PMI and ITILⓇ as competing certification pathways, learners should consider how the certifications can work together. Learners who can effectively apply the ITILⓇ framework to projects they can productively manage will be leaders in the IT industry!